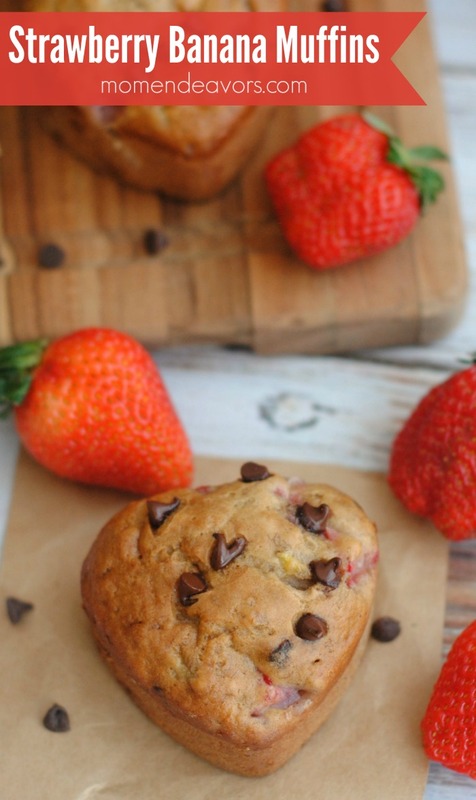 These strawberry banana muffins with chocolate chips make a sweet breakfast treat! ½ C fresh strawberries, chopped + a few extra to put on top of each muffin prior to baking. Preheat the oven to 425 degrees and line a 12 ct. muffin tin with cupcake liners OR spray with non-stick cooking spray. Combine the mashed banana with all the ingredients, except the mini chocolate chips and fresh strawberries, mixing well. Gently add in the mini chocolate chips and fresh strawberries. Fill each muffin well/cupcake liner about ¾ of the way and place a few mini chocolate chips and fresh strawberries on the top of each muffin. Bake for 5 minutes on 425 degrees. After 5 minutes, reduce the oven temperature to 350 degrees and bake another 12-15 minutes.